After hiding for months, Paul finally decided to come out to the public eye and attend the opening night of Broadway’s Meteor Shower. Head to the gallery and check out the photos. I’ve updated the gallery with stills, screencaptures, behind the scenes, and posters from Paul’s new show, Wet Hot American Summer: Ten Years Later, in which Paul reprised his role as Andy Fleckner. The show was released on Netflix August 4. Big Slick Celebrity Weekend is an annual event that happen every year in Kansas City where celebrities get together to raise money for Mercy Children’s Hospital. Paul have been one of the founding members of the event and a huge supporter. I’ve updated the gallery with over 100 photos of Paul through out the last few days. I’ve updated the gallery with photos of Paul attending the Hilarity for Charity’s Third Annual event in New York. I’ve updated the gallery with photos of Paul backstage at the Groundhog Day musical on Broadway on May 5. 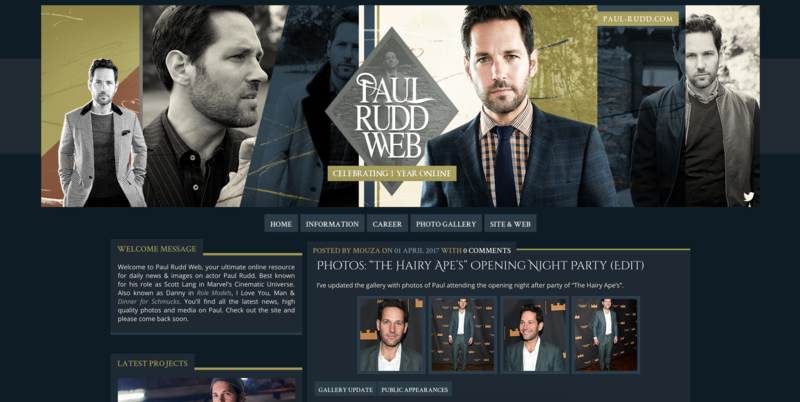 Site Update: Happy Birthday Paul Rudd! Today is Paul Rudd’s 48th Birthday! Myself & my partner in crime Jen would like to wish him an amazing birthday spent with friends & family! As a small way to celebrate Paul’s birthday, my co-web Jen designed our brand new layout for the site & the gallery using one of my favorite Paul shoots from 2013. And as a small gift from my side, I’ve replaced some of the gallery photoshoots with a bigger size and some additional outtakes I found around the web.